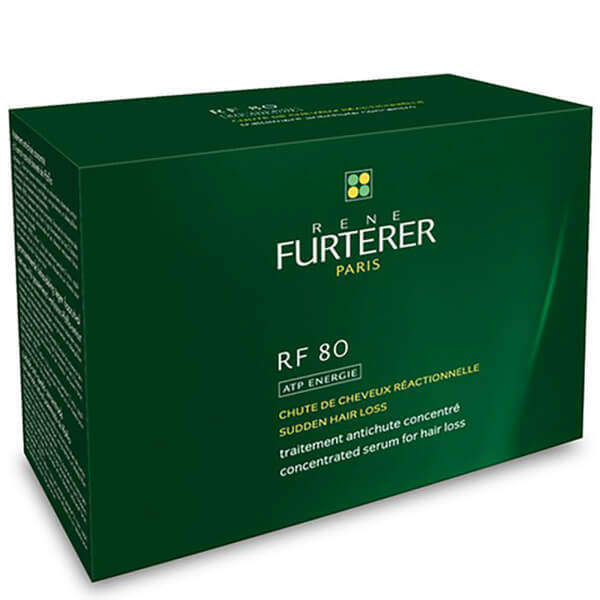 The RF 80 Concentrated Hair Loss Treatment by René Furterer contains natural Pfaffia ® Extract that strengthens and stimulates the capillaries around the root to fight vascular and nutritional hair loss. Pregnancy, stress, an unbalanced diet or medication can all be a reason for sudden hair loss. Scientifically proven, the formula also contains Biotin that promotes stronger hair, Sage and Lemon Essential Oils to improve blood circulation, Vitamins A, F, B5, H and PP that stimulate cell renewal and have antioxidant properties as well as Methionine to stimulate Keratin formation. From the first month of treatment, your hair will appear visibly invigorated, more robust and thicker. Use once a week for twelve weeks as needed. Carefully snap ampoule in a paper towel and place applicator tip on vial. Massage into scalp. Do not rinse. Proceed to styling. Water (aqua), Butylene Glycol, SD Alcohol 39-C (Alcohol Denat), Pfaffia Paniculata Extract (Pfaffia Paniculata), Benzyl Alcohol, Hydrolyzed Vegetable Protein, Arginine, Biotin, Citral, Citrus Medica Limonium (Lemon) Peel Oil (Citrus Limonum), Copper PCA, Limonene, Methionine, Niacinamide, Panthenol, Phenoxyethanol, PPG-1-PEG-9 Lauryl Glycol Ether, Salvia Officinalis (Sage) Oil (Salvia Officinalis), Yellow 10 (CI 47005), Zinc Gluconate.